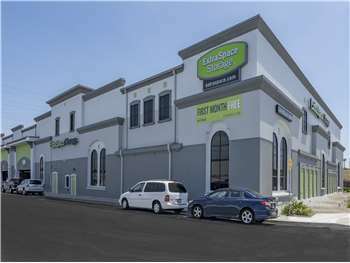 Self Storage in Burlingame, CA at 1280 Rollins Rd. Extra Space Storage is an accessible self storage solution for residents of Burlingame and surrounding areas, including Millbrae and Hillsborough. Our facility is off of Rollins Rd. between Marsten Rd. and Nerli Ln., just southwest of Bayshore Fwy. Locals will recognize our location next to Scottsdale Sport and across the street from Burlingame Motors Mercedes Benz Services. We're also conveniently located for those living in nearby apartments such as North Park Apartments, Broadway Burlingame Apartments, La Solana, Chantilly Arms Apartments, and more. Our Burlingame storage facility offers a variety of storage unit sizes, covered parking, and advanced security features. Whatever your storage needs, we can accommodate them! Storage units start as small as 2x10 and go up to 10x20 and come with a variety of features, such as indoor access, first-floor access, and elevator access. If you have questions about which storage option is better for your needs, don't hesitate to contact us—our staff is more than willing to answer your questions! 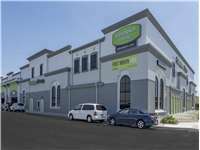 If you need to store a car, motorcycle, boat, or RV in Burlingame, our facility on Rollins Rd. offers covered parking and outdoor parking in a 16x9 size. And with convenient access to Bayshore Fwy., it's easy to pick up and drop off your vehicle at our location. Whether you're storing items of monetary value or sentimental value, you want to know they're well-protected. At Extra Space Storage, we take pride in providing the best security for our customers. We have advanced security features in place—including individually alarmed units, electronic gate access for secure entry, and multiple video cameras throughout the property. See for yourself what makes Extra Space Storage the best self storage solution in Burlingame! Along with a clean, secure, and well-maintained facility, our friendly, professional staff provides quality service that's second-to-none. Rent a unit today and take advantage of our great move-in specials, such as first month free and first month half off! Mike, the assistance manager at the Burlingame location was fantastic and incredible to work with. The facilities are clean, well-organized and there is plenty of parking. It has everything I am looking for in a storage facility and I would strongly recommend. Glad to have found space available at Extra Space Storage. A convenient location, easy process, and friendly staff! While researching storage businesses, the reviews were consistent and high. Meeting the manager and renting the unit was easy and the manager was friendly & helpful. The facility is super clean. Only been storing my belongings for a few weeks, but so far everything is going well. Friendly easy people to work with. Units are very clean. ExtraSpace is by far the most professional company to deal with when you need storage. We contacted and drove to three different storage facilities - each time we were told by their central call station that an appropriate space was available when it was not. When we contacted ExtraSpace, the central call station representative contacted the facility BEFORE we drove there and made certain there was an appropriate space for our camper. Once we arrived we were greeted by an amazing on-site rep who was extremely knowledgable about the facility, measurements of different storage options, what would and would not fit, etc. The rental process was seamless and quick. After three terrible experiences, this was so welcome. Facility is clean. Plenty of carts. Priced the best. Great customer service. Easy access to your storage space. Fair pricing. Clean, secure and friendly. Easy access. We have worked with Sandra and Curt at the Burlingame location of Extra Space Storage for a long time. They are truly amazing to work with-they help us with everything, always have a wonderful customer service manner and are willing to answer questions or help us out with queries. 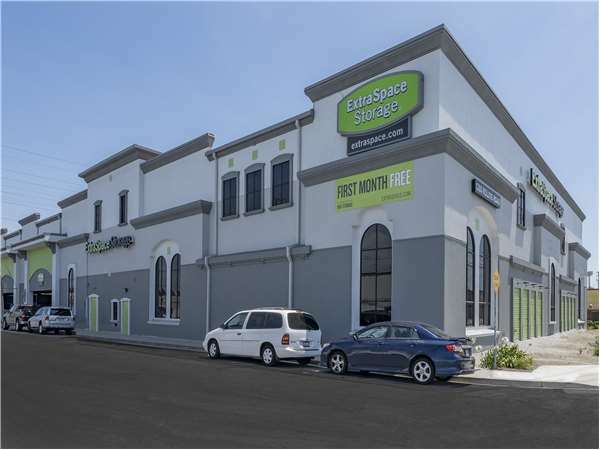 It is a true pleasure to work with this team and to be a customer of Extra Space Storage-Burlingame. Thanks so much! I was completely satisfied with my experience at this facility. The gated lot coupled with the interior security made me feel very secure about leaving my belongings here. Staff is friendly and top notch. Pricing is fair and they don't charge for a full month if you go into the next pay period like some of their competitors. Great customer service. Sandra is just great. I have been renting a space here for so long. My first encounter with the staff went smoothly and they are very friendly. I told them how much stuff I have and they recommended me the right size. Since then, I never encountered any problems. Any inquiries I had were answered knowledgeably. Kurt and Sandra are very professional and flexible. I treat them as family and I know that my belongings are safe. storage building is very clean and maintained. lighting is good and staff is excellent! ExtraStorage in Burlingame is very well run with Sandra, the manager, communicating very well with her staff and informing them when we were coming in during a busy time to open our account. The facility runs well, equipment is well-maintained, and very easy to use. The spaces are clean and cool, making us confident of the safety of our stored things. We all have several options to choose from about our storage needs and I'm thankful I made the right choice by choosing Extra Space Storage. I've been a satisfied tenant there for several years and could not recommend them more highly. My questions and concerns have always been handled in a superbly prompt and professional manner by Kurt and his crew and it is a true pleasure to be their customer. I've used other storage companies in the past and my experience with them has generally been less satisfactory. So I encourage anyone reading this to explore the facts, investigate the options and I'm convinced the more you study the issue, the more likely you will be to make the right choice, Extra Space Storage of Burlingame! I moved back to my old apt in Burlingame from Santa Rosa and I had an abundance of stuff I needed to put somewhere and unlike other storage companies you were the only one with plenty of options as well as being nice and understanding. You guys were a life saver. Thank you for everything. I wish I had know I could have paid less on line. It's clean, convenient, but it's scary for me alone. After viewing other facilities, I found your facility to be heads and shoulders above all the rest. Keep up the good work! I AM EXTREMELY PLEASED WITH THE HELP FROM THE EMPLOYEES, ALWAYS BEING WILLING TO DO ANYTHING TO ASSIST. THE FACILITY IS KEPT UP VERY WELL; IT IS CLEAN, WELL LIT, AND SECURE. I WOULD HIGHLY RECOMMEND THIS FACILITY AS IT IS VERY RESONABLE AND IS IN AN EXCELLENT LOCATION. The location is very convenient, the facility always neat & tidy, and the hours of operation are great. Management always there and are cordial and easy to work with. Patient and helpful when using the code for the 1st time to get the bugs worked out of it. We found this building just of off of the Broadway exit from the 101 and it couldn't be more convenient. Plus they gave us a discount upon moving in and then raised our rent. When the storage facility changed hands, there were a few short-term hiccups but everything was resolved by the management. The location is extremely convenient, the facility always neat & tidy, and the hours of operation are great. Management on hand always greets you with a smile and is engaging. This facility meets all the requirements I need for storage. Those most important are a dedicated maintenance and cleanliness policies. Security and convenience are also exceptional. I always recommend the facility to friends and business associates. From San Francisco: Take US-101 south towards San Jose. Take the 419B exit towards Broadway. Make a right onto Broadway. Make a slight right onto Rollins Road - continue down Rollins Road for about 50ft, and we are located on the right. From San Jose: Take US-101 north toward San Francisco. Take the Broadway exit (419B). Merge onto Broadway (0.5mi) Make a slight right onto Rollins Road – continue down Rollins Road for about 50ft, and we are on the right. Take US-101 north toward San Francisco. Take the Broadway exit (419B). Merge onto Broadway (0.5mi) Make a slight right onto Rollins Road – continue down Rollins Road for about 50ft, and we are on the right. Take US-101 south towards San Jose. Take the 419B exit towards Broadway. Make a right onto Broadway. Make a slight right onto Rollins Road - continue down Rollins Road for about 50ft, and we are located on the right.